1880s autograph album that belonged to Marie Louise Reiss of Quincy, Illinois. 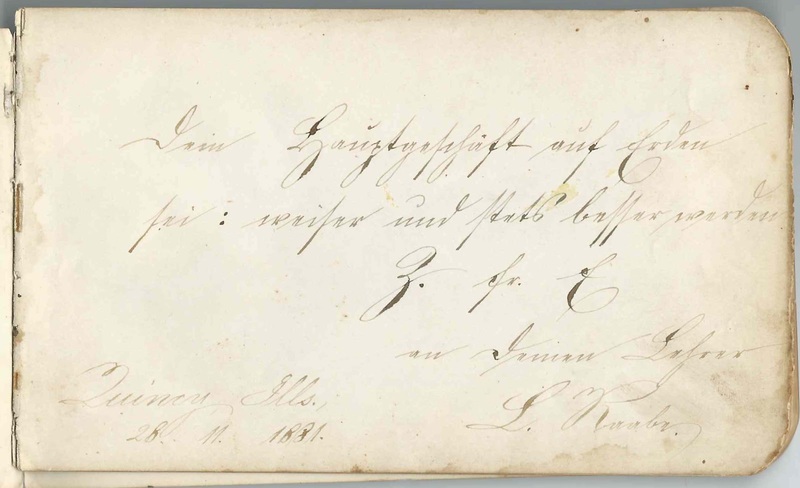 Several of the pages are inscribed in German; readers' translations are welcome! The album measures approximately 7" x 4-1/4" and contains the sentiments of 15 of Marie's relatives, friends and schoolmates. An alphabetical surname list and an alphabetical list of the signers, together with any personal information they offered, appear at the end of this post. Marie Louise Reiss was born April 10, 1866 in Tennessee, the daughter, I think of Gustave and Marie L. Reiss, German immigrants. 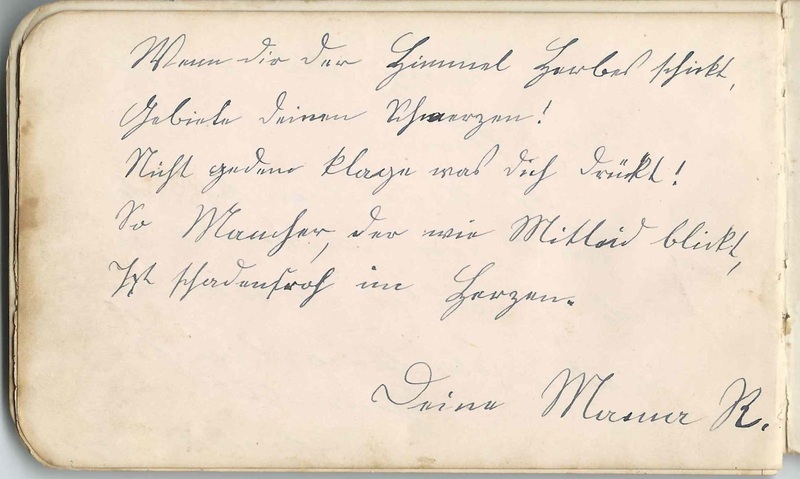 The page below, written in German, may have been inscribed by Marie's mother. 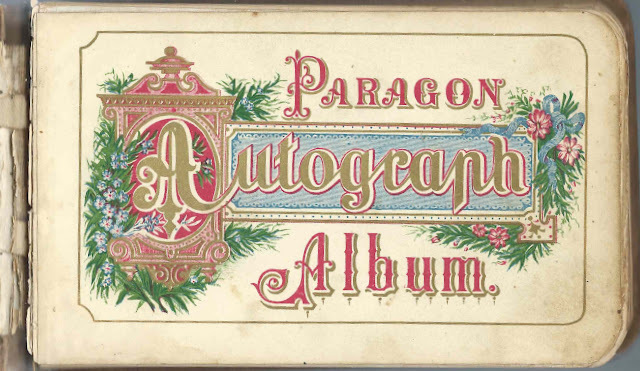 One, possibly two, of Marie's uncles inscribed pages in the album. 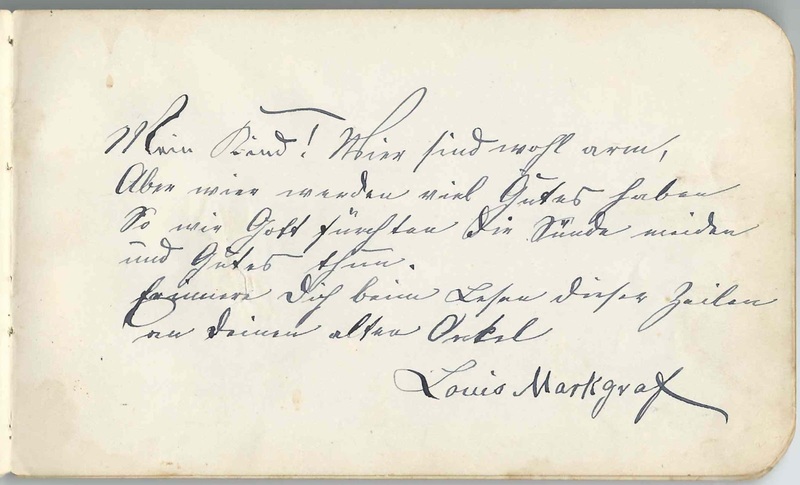 Uncle Louis Markgraf inscribed a page also in German. Uncle, or perhaps brother, Carl Reiss inscribed a page at Quincy, Illinois, on August 12, 1880, again in German. 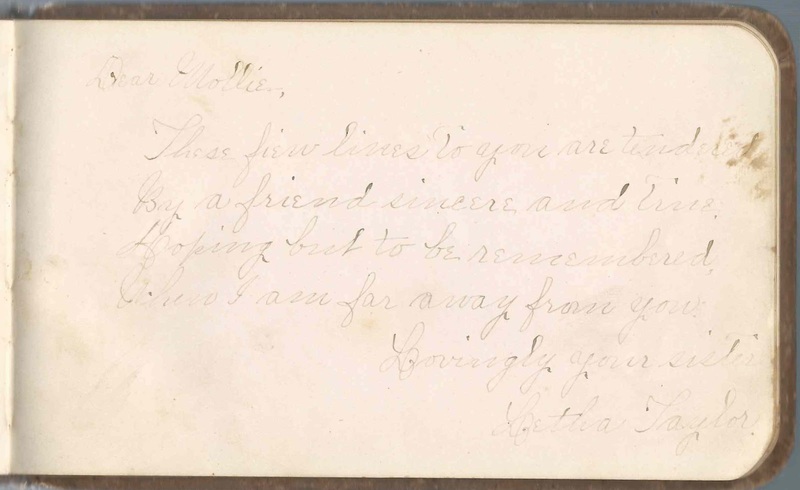 Letha Taylor inscribed her page to "Mollie", apparently Marie's nickname, and called herself Mollie's sister. I don't know if she was a sister, a half or stepsister, a sister-in-law or a social or religious sister. 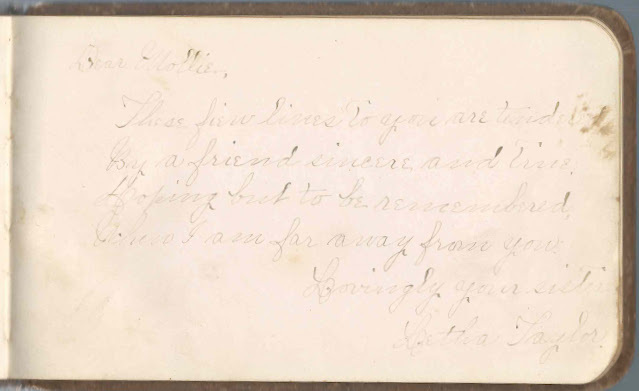 About 1884, Marie married William R. Davis, who was born in Missouri on July 6, 1861. They farmed at Olive, Oklahoma and raised, I think, at least 9 children, though I don't know if all survived to adulthood. William died in 1933 and is buried at Garber Cemetery in Garber, Oklahoma. Marie's name is on the stone as Mary L. with her birth date, but her death date is not etched in; either the stone was not updated or she is buried somewhere else. 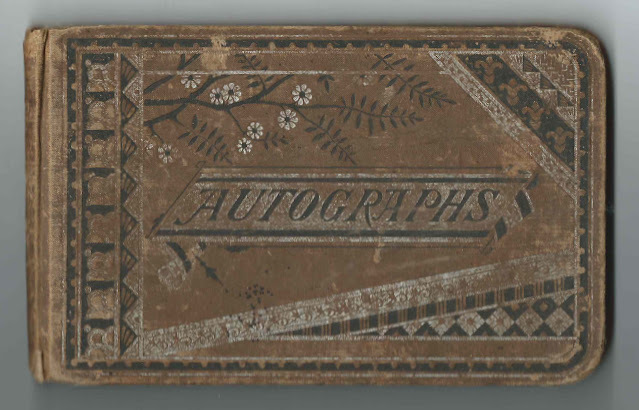 At least one of Marie's teachers at Quincy, Illinois, inscribed pages in her album. 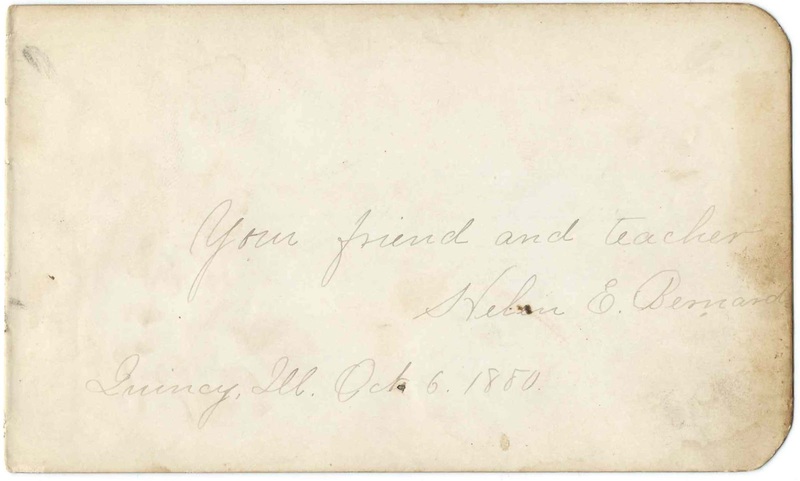 Helen E. Bernard inscribed a page on October 6, 1880. 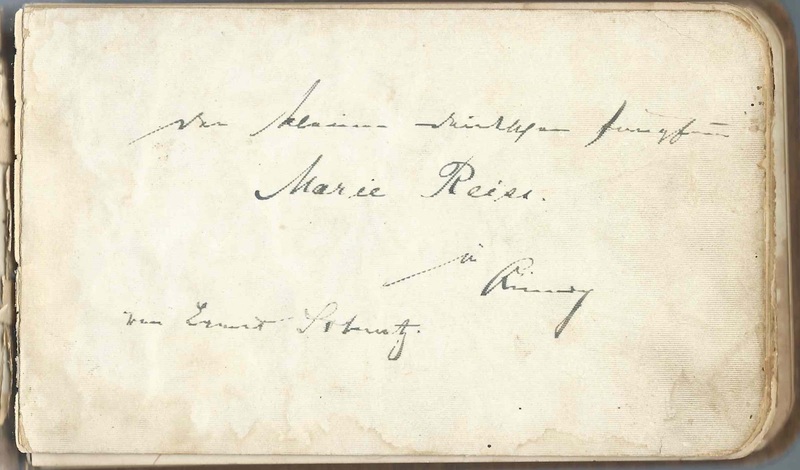 I've been told that the person with the surname Raabe who inscribed a page at Quincy, Illinois, in 1881, may also have been a teacher. If you can translate/decipher the page, please leave a comment. If you have corrections and/or additions to the information above, or information on any of the signers listed below, please leave a comment or contact me directly. 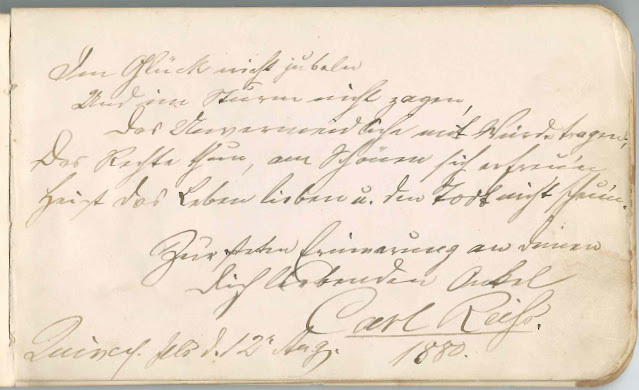 And please weigh in if you can translate the pages written in German. Possibly signed by Maria's mother. Z ? C.. L. Raabe, signed at Quincy, Illinois, on November 28, 1881. L. Raabe may have been Marie's teacher. Carl Reiss, signed at Quincy, Illinois, on August 12, 1880; sentiment written in German. Marie's uncle or her brother.